Liquids, oils and grease tend to reduce your grip fairly quickly. To protect your hands and forearms from hazardous substances even in wet and greasy environments, the Uvex Profastrong Chemical Nitrile-Coated Gloves NF33 have been designed with a grip structure on the palms that can greatly improve your grip in all environments. 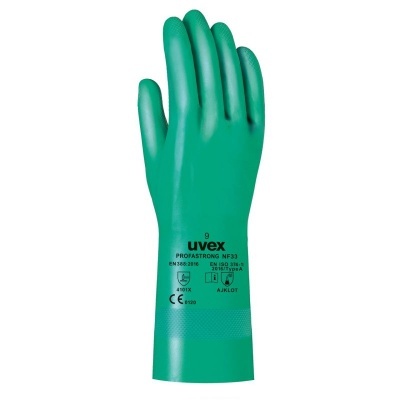 The Uvex Profastrong Chemical Nitrile-Coated Gloves NF33 have been approved as suitable for contact with food, including aqueous, acidic, alcoholic, dry and fatty foodstuffs. This makes them ideal for tasks such as food manufacture, ensuring that all hygiene protocols are met. The Uvex Chemical Nitrile-Coated Gloves NF33 are available in four sizes that should suit the hands of most users. Please measure the circumference of your hand around the knuckles (excluding the thumb) with your hand open and your fingers together, and the length of your hand from the tip of your middle finger to your wrist.